“The CHS Washington, DC/Baltimore Chapter welcomes you! We are excited to have so many major hospitality headquarters and organizations in the DC area and with them a significant population of Hotelies! Our local chapter provides many opportunities that support this mission, as well as great opportunities to get out and have fun. We have hosted numerous events in the Greater DC and Baltimore areas and will continue to do so throughout the year. We are inspired to create enriching experiences for others, celebrating what it means to be a Hotelie for life. We encourage established and new Hotel School alumni to become active in the DC/Baltimore Chapter. There are many opportunities to join the momentum through planning events, participating in social networking, scholarship fundraising and community service. On March 23, 2019, the DC/Baltimore chapter toured New Columbia Distillers in Washington, DC. On Wednesday, February 27, 2019 S.C. Johnson College of Business Dean Kevin Hallock and SHA Dean Kate Walsh spoke to alumni in Washington D.C.
On Monday, December 17, 2019 the CHS DC/Baltimore chapter hosted a happy hour at Rosa Mexicano in DC. On Saturday July 21, 2018, Hotelies gathered at Mayorga Organics for a factory tour and coffee tasting. 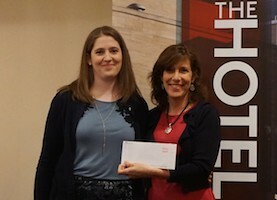 At reunion on June 8th, Erica Killam ’08 from the CHS Washington DC/Baltimore chapter presented an $8,000 check towards the chapter’s endowed scholarship fund. 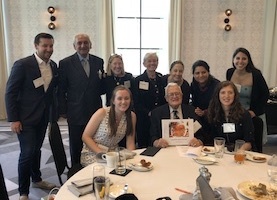 On May 12, 2018, the Cornell Hotel Society of Washington DC/Baltimore gathered with 40 members to celebrate the 90th anniversary of CHS. 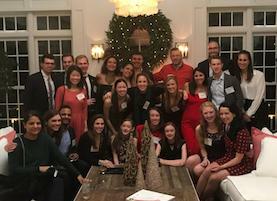 On December 16, 2017, over 100 D.C. and Baltimore area alumni gathered at the home of Kevin and Amanda Jacobs for the chapter’s annual holiday party.